Travis came to us by referral from Dr. Kristina Grewal. He had a laminitic episode previous to coming to us and Dr. Grewal discovered he had a fracture in his right front hoof. He also had under run heels on both hooves and flaring in his left front hoof. 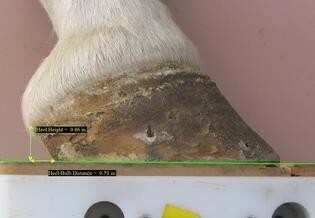 By implementing the Epona Trim and using EponaShoes, we were able to help Travis heal. We avoided putting excess pressure underneath the fracture by putting packing on that area of the shoe. This provided a cushioning effect for the sensitive area where the fracture was. After four shoeings and three months, the fracture was well on its way to healing. May 27, 2010 - After only four shoeings, the fracture is almost completely healed. March 5, 2010 - The fracture can clearly be seen in this image. 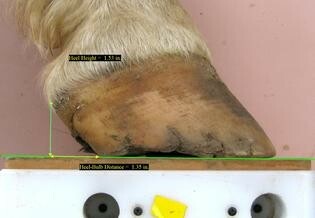 Travis's heels were under run and the quality of hoof was poor. 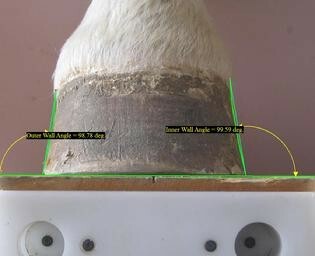 After only four shoeings, the heel to bumb distance was lowered and the over all appearance of the hoof improved. From the Dorsal view, Travis's Right hoof is very upright and boxy. This is probably due to lack of use because of the pain of the fracture. As we were able to make him more comfortable and promote healing, the walls began to open up.